Gluten-free vegans, rejoice! 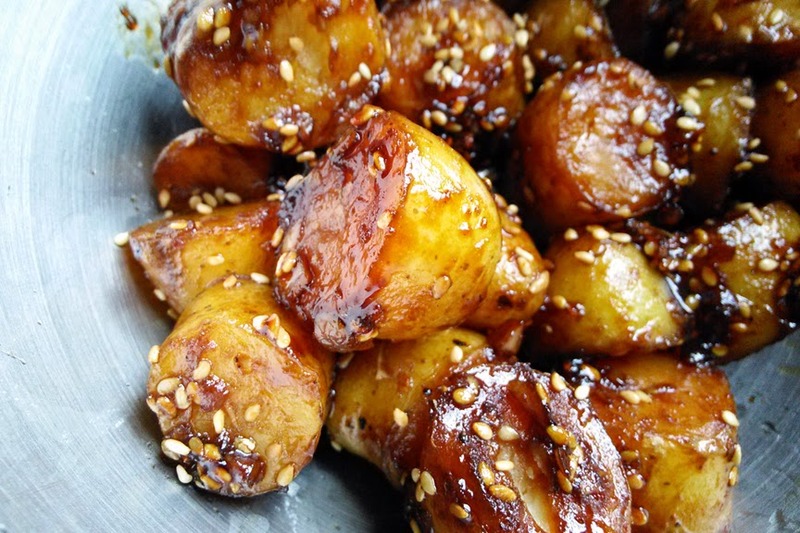 This is banchan (side dish) is for you— heatgamja jorim, better known as candied Korean potatoes made with sweet soy sauce. It’s best made with smaller new potatoes, or as we do on Guam, the smaller Asian sweet potatoes. 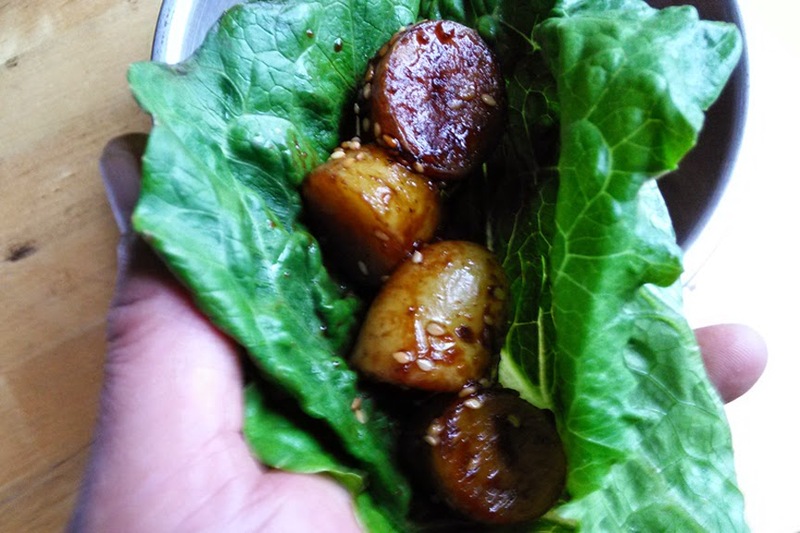 Larger potatoes tend to get mealy with type of dish. 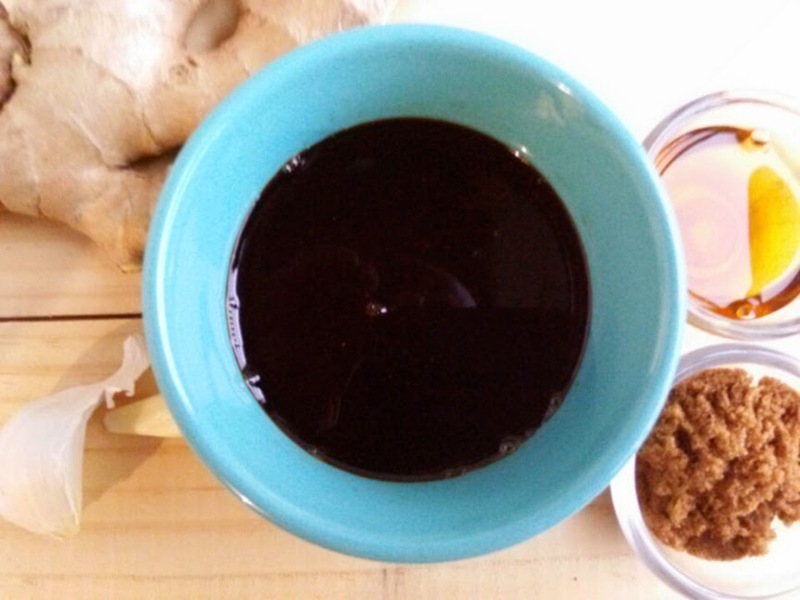 You can buy sweet soy sauce, but it’s always much better if you make your own especially if you are eating gluten-free. We made this at ICE in the Essentials of Korean Cooking class (Sandy Murzun, instructor). There are actually many types of soy sauce, of which we normally use two; dark soy sauce is not as robust in flavor as its lighter counterpart. 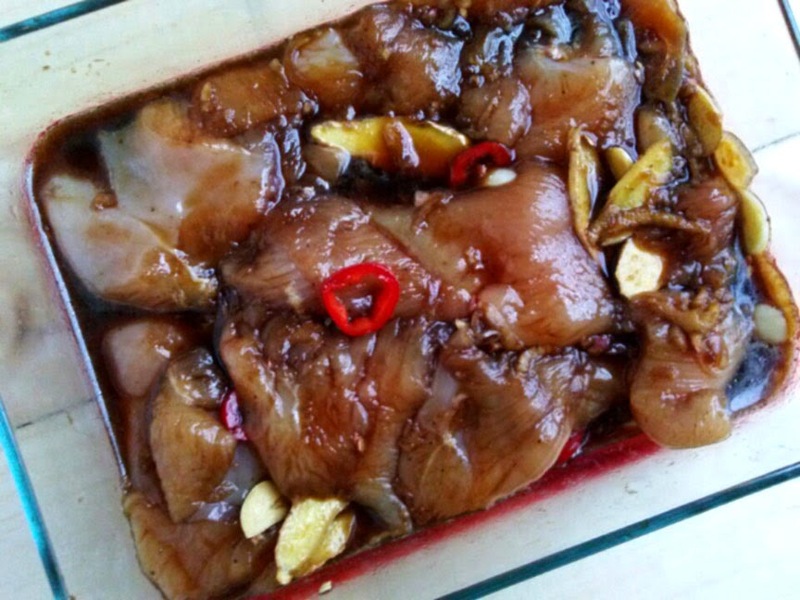 Generally it’s fermented with soy beans alone, where as light soy sauce is blended and brewed with wheat, sugar, rice wine and other ingredients. Asian chefs prefer the pure flavor of dark soy for cooking, and light soy as a condiment at the table. 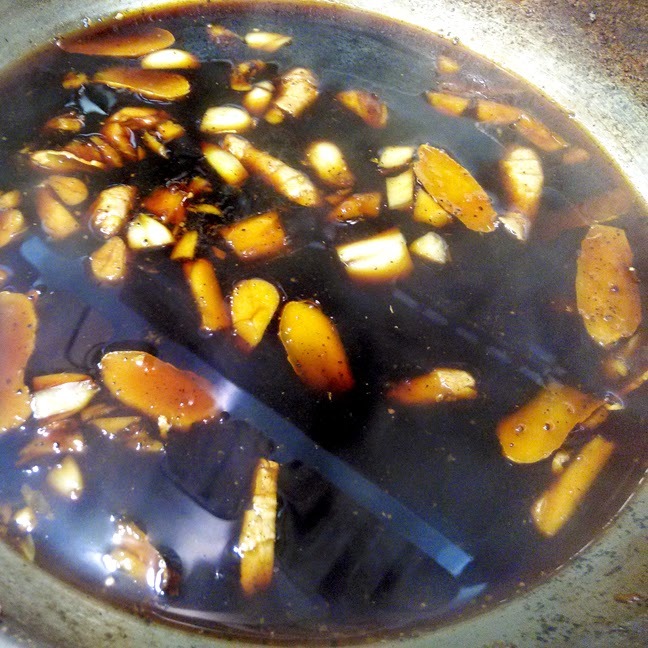 Every Asian culture has its own version of a sweet soy sauce for marinating meats or for making dipping sauces. Mine harkens back to the post-WW2 era of American occupation using a little whiskey and soda. This is a two-part recipe. Let’s make some sweet soy sauce first. Prepare ginger and garlic, add a little salt and set aside. Pour soda into a deep sauce pan; allow it to go flat for 10 minutes. Set flame to medium, add ginger, garlic and black pepper. Simmer until the liquid is reduced by 1/3 stirring constantly. Add dark soy sauce, brown sugar (or corn syrup) and whiskey. Simmer for 8 to 10 minutes more stirring occasionally. Remove from heat and strain through a fine sieve into a bowl, set aside to cool. For immediate use, set bowl into an ice bath to shock it cold. Store refrigerated in a closed container; sweet soy sauce will keep refrigerated for up to 6 months. Prepare garlic and ginger, peel and mince. Toast sesame seeds in a pan and set aside. Wash new potatoes, dry well, remove any blemishes and cut into halves. Boil potatoes until they are fork-soft, rinse under cold water and drain well. Set aside to cool or shock in an ice bath. Heat peanut oil to smoke point in a large non-stick pan. Lightly salt potatoes and pan-fry for 4 to 5 minutes until the skins are slightly crisp. Remove from pan and set aside. Add all remaining ingredients to pan except for toasted sesame seeds, stir until sugar is dissolved. Add potatoes to pan and simmer until the liquid has thickened and potatoes are evenly coated. Sprinkle with sesame seeds. Set aside to cool. This dish is best served cold... like revenge. This sounds incredible!!!! I will absolutely, be making this shortly.